Have I told you I’ve been on a taco kick lately? Well I have- they’re simple, delicious, and easy to prepare. I don’t necessarily go ultra-authentic when I’m making tacos, I simply grill some meat, saute some onions and peppers and, if I have the ingredients on hand, make pico de gallo and guacamole or Avocado Crema. 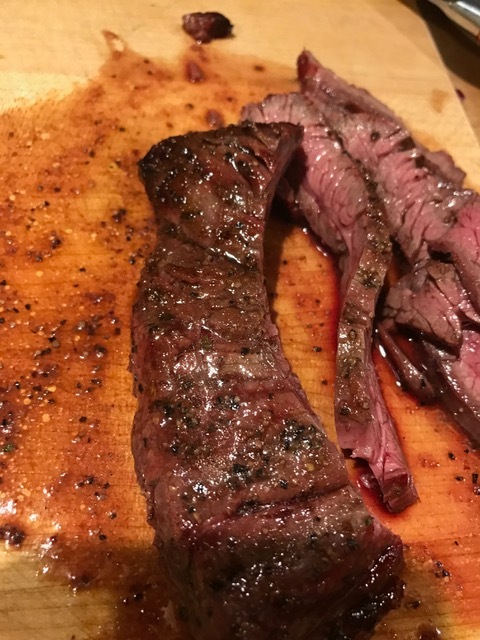 Skirt steak is probably my favorite cut of beef- yes, even over a ribeye. I love the flavor, texture and ease of preparation, and I have quite a few recipes that I use pretty often. One of my favorite ways to cook it is on my Big Green Egg with my Southwest Seasoning blend. The spice blend has quite a few ingredients, but I tend to make a double batch at a time and keep it around the house for quick meal preparations as it’s one of my go-to seasoning blends. 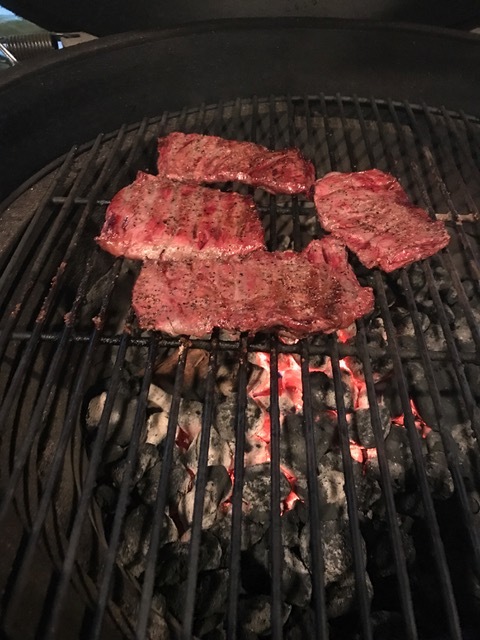 The trick to skirt steak is twofold- don’t overcook it and cut it against the grain. The meat doesn’t have a lot of marbling, but lends itself to picking up flavors easily, so no need to over-season. Generally I cook skirt steak by either grilling it at very hot temps or by cooking it sous vide (more on that later.) However, sometimes I want to add some smoke flavor to the steak so I run my grill at a lower temp. One pound of skirt steak will make 6-8 tacos, depending on how high you pile the meat. Season the skirt steak with my Southwest Seasoning Blend, cover and refrigerate for 2-3 hours. Remove from refrigerator and sit on counter 15-20 minutes before cooking to allow to come up to room temperature. Sautee onions and peppers in oil, season with salt and pepper and set aside. 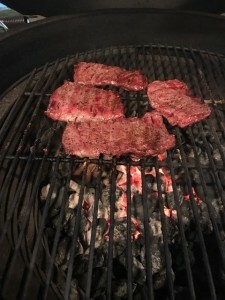 Place the skirt steak on the grill (on the Egg, I put it over the coals, as they are far enough away from the grate to not burn but still cook fairly quickly. Close lid and allow to cook for 6 to 7 minutes, or until steak is getting browned (at these temps you’re not going to get grill marks.) Flip steaks and allow to cook until internal temperature hits 140 (if you want medium temperature.) Remove from grill, allow to rest for 3-4 minutes, and slice against the grain into ¼” strips. While meat is resting, warm tortillas on the grill and heat up onions and peppers if necessary. Serve with pico de gallo, guacamole, or your favorite taco condiments. Enjoy! Cut avocados in half, remove seeds, and scoop out pulp into a mixing bowl. Using a fork, gently mash avocado pulp. Add pico and lime juice and stir until incorporated. Add salt and pepper to taste. Serve immediately.